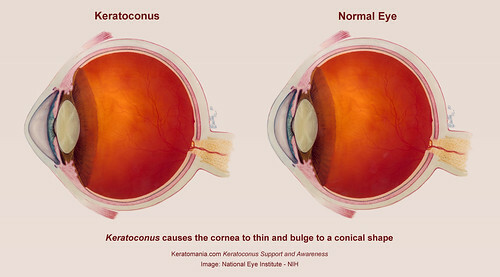 Keratoconus (ker-uh-toe-koh-nus) is degeneration of the structure of the cornea. normally, the cornea has a dome shape, however in keratoconic patients, the structure of the cornea is not strong enough to hold its shape and it bulges outward into a cone shape, gradually cornea gets more thin and changes to a more conical shape than its normal curve. Keratoconus can cause significant distortion of vision, nearsightedness, irregular astigmatism, ghosting with multiple images, glare and light sensitivity. normally keratoconus affects both eyes but each eye may be affected differently. it often begins in the patient's adolescent years and it may progress for 10 to 20 years. See also: A simulation of keratoconus patient vision. The cause of keratoconus is unknown, it affects around one in every two thousand persons, it has been found in all races, it seems it occurs almost equally in both sexes and about less than ten percent of patients has a relative who is diagnosed with keratoconus. some studies also suggest vigorous eye rubbing contributes to the progression of keratoconus, although currently the association of keratoconus and eye rubbing is just a clinical observation and a cause/effect relationship has not been established but Keratoconic patient are discouraged to not rub their eyes. Keratoconus can be diagnosed by a slit lamp examination and measuring the cornea's thickness and curvature by corneal topography or keratometry. in its early stages, vision problems may be corrected with glasses or soft contact lenses, as it progresses and the cornea becomes more thin and irregular in shape, glasses and regular soft contact lenses won't do any help to correct vision and other treatments may be needed, such as rigid gas permeable contact lens or intrastromal corneal ring, in advanced cases, corneal transplantation (corneal grafting) may be the last resort.